Snowshoes allow people to walk across the top of deep snow. They distribute weight so that the walker does not sink into soft drifts, and enable people to roam through landscapes that are usually impassible with only ordinary footwear. Snowshoes are of ancient origin, and until roughly 1950, they were made of wood, with rawhide bindings. After 1950, manufacturers came up with new materials and designs. Snowshoes of the twenty-first century are most often made of lightweight metal and other manmade materials. The design too has altered somewhat from the traditional snowshoe. Modern snowshoes, also called Western snowshoes, are often an asymmetrical shape. A large shoe might be 30 in (76 cm) long by 10 in (25 cm) wide, and a small shoe, such as the type used for racing, may be slightly narrower, and only 25 in (64 cm) long. With the development of lightweight snowshoes that require no maintenance and little specialized equipment, the sport grew. Snowshoeing became very popular in the United States in the 1990s, and in many areas, it rivals cross-country skiing. The first snowshoes originated in Central Asia in about 4000 B.C. Probably people crossing the Bering Straits land bridge into North America came on snowshoes or brought the technology with them. Native North Americans used snowshoes extensively. They made hundreds of different shapes and varieties, suitable for many different terrains. Many wood-framed, or traditional, snowshoes are named for the Native American tribe that used that particular design, such as the paddle-shaped Huron snowshoe, and the front-pointed Ojibwa model. The tribes that relied most on snowshoes were the Athabascans on the West coast, who made snowshoes with upturned toes, and the Algonquins of the upper Midwest and Canada. Tribes living on the plains, such as the Sioux and Blackfoot, also used snowshoes in winter, though later they became more dependent on horses for winter travel. The snowshoe designs perfected by the Algonquins and other woodland tribes remained in use through most of the twentieth century. Native American snowshoes were made of a hard wood, such as ash. The wood was soaked or steamed to make it pliable, then bent into shape. The frame was laced with rawhide, and the lacing was often beautifully intricate. French trappers and traders who worked and lived in the St. Lawrence River valley adopted snowshoes from the Native American people. Apparently when English people began settling in the same region, they did not take to snowshoes, and eventually this became a serious military disadvantage. English troops were defeated by their more agile foes in the French and Indian War, culminating in a loss in the so-called Battle on Snowshoes near Lake George in New York in 1758. Only then did snowshoes become standard winter gear for the British in North America. Later, as European settlers pushed west across North America, they brought snowshoes with them as essential tools of winter travel. Snowshoeing purely for recreation also has a long history. Snowshoe clubs were formed in Quebec in the late eighteenth century. Groups met for hikes or for competitive races. The races were sometimes for long distances, sometimes for speed over short distances, and some even required the participants to jump hurdles. In French Canada this grew into a serious sport, and fostered an intense rivalry between Native American and European participants. Some native snowshoe makers developed lightweight racing shoes with a small, narrow design, until the Montreal snowshoe club set a limit in 1871, requiring that snowshoes had to weigh at least 1.5 lb (0.68 kg). More relaxed snowshoe hikes, including women and children, were also a fixed part of the social scene in French Canada and the Eastern United States up through the 1920s and 1930s. Snowshoeing seemed to have fallen out of popularity across most of North America until advances in materials attracted a new generation to the sport. In the 1950s, snowshoe designers experimented with a variety of materials to make durable, lightweight shoes. A Canadian company, Magline, developed a magnesium snowshoe in the late 1950s that used webbing made from steel airplane cable coated with nylon. Aluminum snowshoes arrived around the same time, as well as snowshoes made of new materials, such as Lexan, which is the trade name for polycarbonate, the material used in astronauts' helmets. Even manufacturers of traditional wood-framed snowshoes experimented with manmade materials in the lacings, for example switching from rawhide to nylon coated neoprene. The new materials surpassed the old, because they did not require extensive care and maintenance. Wood and rawhide shoes had to be revarnished periodically and the webbing waxed, or else they would lose their water resistance. And like all wood products, they were subject to shrinking and swelling with changes in humidity. New materials, however, eliminated these problems. Traditional snowshoes are made of a hard wood, usually ash. The webbing material is rawhide, which is strips of denuded animal skin. The animal from which the webbing material was retrieved was traditionally moose, deer, or caribou. But in the twentieth century, most manufacturers switched to cow hide. At least one United States manufacturer imported water buffalo hide for an extra-tough webbing, but cow hide is generally the cheapest source for acceptable quality rawhide. Some manufacturers continued to make wood frame snowshoes even after new materials grew popular, but they switched to neoprene for the webbing. Most snowshoes today are framed in aluminum, usually in an alloy form that is both ultralight and very strong. Some manufacturers coat the aluminum with powdered plastic. The deck, or section on which the foot rests, is made of various materials, usually neoprene, polyurethane, or a composite material such as polyurethane coated with nylon. The material for the binding, which holds the snowshoe to the foot, is usually similar to the decking material. Other materials used may be plastic for some straps, rivets, or eyelets, steel for rivets, and aluminum or other metal for the cleat fitted on the bottom of the snowshoe. Some manufacturers use graphite for the snowshoe frame. This is the ultralight material popular in tennis racket manufacturing. Traditional wooden snowshoes are still manufactured very much like they were thousands of years ago. The wood used is usually ash, which is strong and straight wood with an appropriate moisture content. 1 For the very finest snowshoes, the wood is carefully split by hand to get the straightest grain. However, most manufacturers rely on wood sawn at a sawmill, for reasons of cost. The manufacturer checks the wood for poor grain and large knots, and discards any wood that is not of the right quality. Then the wood is steamed, to make it pliable. When the wood is soft enough, the manufacturer bends the wood into the shape of the snowshoe frame. The frames are then dried, usually in a kiln or hot room. This takes two to seven days. 2 After the frames have dried sufficiently, the manufacturer sands them and coats them with vamish. Holes are drilled for the lacing, and two wooden cross pieces are inserted. A. Traditional snowshoe. B. Aluminum snowshoe. 4 Lacing is usually done by highly skilled, specialized workers. Lacing with genuine rawhide is usually done on site in the snowshoe factory, since the hide can spoil and has to be kept under optimum conditions. Neoprene does not spoil, and many manufacturers hire workers to do neoprene lacing in their homes. An expert lacer can finish up to ten pairs of snowshoes in a day. The laces are woven in an intricate pattern and drawn tightly through the holes in the rim of the frame. A heavier gauge lacing is usually used for the center portion of the shoe, directly under the foot. 5 The worker who laces the webbing usually also affixes the binding, which is the arrangement of straps that holds the foot to the snowshoe. Then, the snowshoes are returned to the factory and inspected. They undergo a further period of drying. Next, they are boxed and shipped to retailers. 1 For aluminum snowshoes, the metal arrives at the snowshoe factory in precut lengths of seamless tubing. After inspecting the tubing for any obvious flaws, workers insert each piece into a machine called a bender. This is a machine that has been designed for the specific finished shape and diameter of the snowshoe frame. It locks around the tubing tightly, and then a worker depresses a lever, and force is exerted to make the bend. Some machines work manually, with the worker providing the muscle power. Other machines are hydraulic. When the worker removes the tubing from the bender, it is shaped exactly as needed for the snowshoe frame. The frame may be ready to for the decking at this point, or it may next be powder coated. 2 Powder coating is usually done by an outside contractor. The aluminum frames are electrically charged, and then sprayed with a fine mist of dry, powdered plastic. The powder clings to the charged metal. Then the frames are heated, and the plastic melts onto them. Then the frames are returned to the snowshoe factory for the remaining steps. 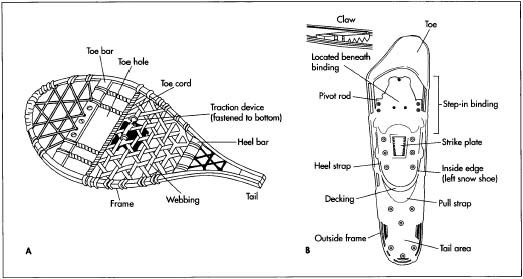 3 The deck is the main part of the snowshoe, taking the place of the webbing in a traditional shoe. The decking material arrives at the factory in a wide roll. Workers unroll the material and feed it into a die stamper. This is a machine mounted with razors in the outline of the deck shape. The stamper lowers and presses through the material, cutting it in one motion. The manufacturer arranges the dies so that the decks can be cut very close together. As little as a quarter inch of material may be lost. This material is not recyclable, and represents the biggest waste in the manufacturing process. The binding straps are cut with different dies, but in the same process, and the material used is very similar. 4 Next, the cut deck is imprinted with the manufacturer's logo. The deck is passed under a heated die stamper. The stamper is carved with the logo, and affixed with a piece of plastic that bears heat-sensitive ink. When the heated stamper presses the plastic onto the deck, it leaves an inked impression of the logo. The ink dries almost immediately. 5 Now workers rivet the deck to the frame. This may be done by hand, or in a large facility, the process may be automated. Small plastic straps fit around the frame and hold the deck in a sandwich between the ends. The rivet is punched through. Rivets are placed at many points along the frame, to hold the deck securely. 6 To finish the snowshoe, a cleat needs to be affixed to the bottom, and the binding and a plastic pivot strap need to be attached to the top of the deck. The plastic pivot strap is die-cut. The cleat is often supplied by an outside contractor. The binding and strap are fitted to the deck and the cleat fixed underneath. Then, these three parts are riveted together through the deck, so they are all held in place by the same part. At this point, the snowshoes are finished. They do not need any drying or curing, but are ready to be boxed and sent to retailers. A conscientious manufacturer inspects all the raw materials for the snowshoes as they come into the factory. The workers check for problems with each step of the process. Because the parts fit very precisely, any fault in the process is usually immediately apparent. For example, if the decks were not cut correctly, they could not be clipped to the frames. The manufacturing process is also slow. Most makers are small, and produce a quality product. Snowshoes are not rushed through a highly automated assembly line, so visual inspection along the way is usually adequate quality control. The worker who tags the finished snowshoes and prepares them for shipping may act as a final inspector. For design problems, most manufacturers have relationships with avid snowshoeers who can take a new pair through several hundred miles in a few weeks, so the manufacturer can get relatively rapid feedback from users about design flaws or successes. Though nonwood snowshoes are described as modern or new-style, they have nevertheless been around for about 50 years. In other words, they are not terribly new. Increased popularity of the sport in the 1990s led to more marketing of the equipment and opening of more resorts and trails to snowshoeers. But new technology does not seem imminent. Snowshoes are appearing in gaudier colors and in styles aimed at new segments of the market, such as women and children. This may ultimately confuse the consumer, since men, women and children can essentially wear the same snowshoe. Edwards, Sally, and Melissa McKenzie. Snowshoeing. Champaign, Illinois: Human Kinetics, Inc., 1995. Prater, Gene. Showshoeing. Seattle: The Mountaineers, 1997. Wolfram, Gerry. Walk into Winter New York: Charles Scribner's Sons, 1977.